Hayden Kennedy and Kyle Dempster are the recipients of the 2016 Alpina Watches / American Alpine Club (AAC) Cutting Edge Award which is presented each year to “one American climbing team, who with the aid of an AAC climbing grant, demonstrates excellence in skills and accomplishment in cutting edge climbing objective and who upholds the values of the American Alpine Club, acting as world-class ambassadors to American climbing both domestically and abroad,” according to a press release by the ACC. The award was presented at the 2016 Excellence in Climbing Awards Dinner held on May 7 in Denver. 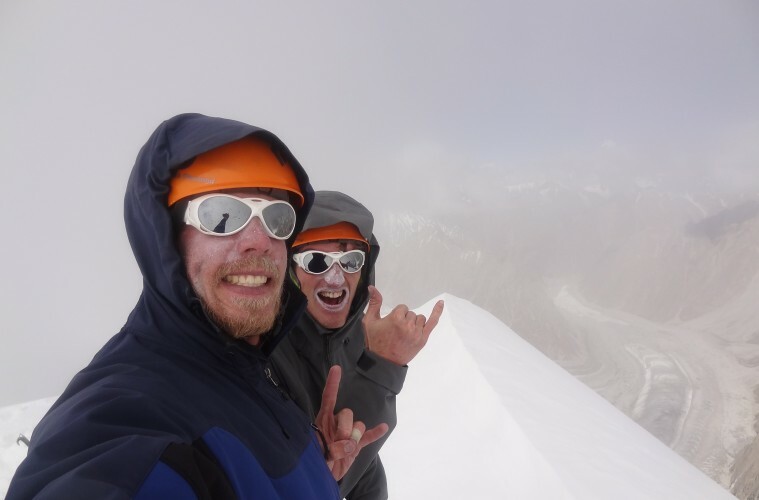 Kennedy and Dempster established two new routes in Pakistan’s Karakoram, the east face of K7 and the south face of Ogre I. For anyone unfamiliar with the climbing in this area, it is as remote and extreme as any place on earth, that alone is cause for admiration. But these fellows also accomplished these feats while displaying unusual observation of mountaineering ethics and represented the American climbing community with distinct class and honor. The team made two attempts, one on each 7,000+ meter peak, and despite the odds and challenges, they succeeded on both. They dubbed the expedition “the Pakistani Doubleheader.” On the east face of K7, the team was ambushed by whiteout conditions leading to a miserable 49 hour push, through “treacherous conditions of deep, unconsolidated snow.” Then, another whiteout snowstorm pinned down the team for 8 days as they waited to begin objective #2: a new route up Ogre 1. Finally the storm broke and on August 19th, one month after the team summited K7, Hayden and Dempster began their trek, heading up the Choktoi Glacier to the south face of Ogre 1. The route required the alpinists to climb un-roped on 60-degree ice and snowfields, but after two days, the summit was taken. To learn more about the duo’s trek through Pakistan, click here. Hayden began rock climbing career on Castleton Tower, a stunning desert spire outside of Moab, UT, when he was just 13. He now works toward the goal of personal mastery in all aspects of climbing. He says that he finds inspiration from the struggle of a hard redpoint, or the mental challenge of a sketchy alpine lead-climb. Sponsored by LaSportiva, Patagonia, and Black Diamond, his career highlights include: Ascent of Exocet Chimney (6a WI5 MI3), Cerro Standhardt, Patagonia, Ascent of the Huber-Schnaf (6b+ MI3), via a link up with the Spigolo dei Bimbi (6b MI5) on Torre Egger, Patagonia, and the first “fair means” ascent of Cerro Torre’s Southeast Ridge. Kyle also got a young start into his climbing career, joining forces with his cousin Drew at the age of 12, he never looked back. While he is not very well known outside of the climbing community, he is indeed one of the worlds leading alpinists with numerous first ascents to his name, around the world. Struck by the tragic accidental death of his cousin in a rappelling mishap, he nearly gave up the sport but found inspiration and has continued on. Sponsored by LaSportiva and Outdoor Research, he’s been nominated three times and twice won the prestigious Piolet d’Or, which is alpine climbing’s highest honor. The American Alpine Club is a 501(c)(3) charitable organization. Their vision is a united community of competent climbers and healthy climbing landscapes. The AAC provides support for American climbers both domestically and worldwide; provides grants and volunteer opportunities to protect and conserve climbing destinations; hosts local and national climbing festivals and events; publishes two of the world’s most renowned climbing annuals, the American Alpine Journal and Accidents in North American Climbing; cares for the world’s leading climbing library and country’s leading mountaineering museum; manages the Hueco Rock Ranch, New River Gorge Campground, and Grand Teton Climbers’ Ranch as part of a larger lodging network for climbers; and annually gives more than $80,000 toward climbing, conservation, and research grants that fund adventurers who travel the world. Learn about additional programs and become a member at americanalpineclub.org. Alpina Watches International SA is an independent family-owned manufacturer of luxury wrist watches based in Plan-les-Ouates, Geneva, Switzerland. The company was founded in 1883 by Gottlieb Hauser, a watchmaker in Winterthur, who founded the Swiss Watchmakers Corporation. Alpina’s watches are designed to be robust sport watches that perform to the highest precision and with the greatest reliability in the most demanding situations. In 2015 Alpina introduced the first Swiss Made Smartwatch, thereby creating a new watch category in the Swiss watch industry, the Horological Smartwatch. Alpina’s mission is to design and engineer luxury sport watches that operate with the greatest precision and reliability possible in the most demanding sporting environments, like the Alps.